There are certain seasons of the year when pastors like to have missions conferences. February through March and September through October seem to be popular conference times. School is back in, so families are not traveling on vacation. It is not during Thanksgiving or Christmas. Generally it is not too hot or cold (depending on what part of the country you are in). So, as we are now finishing up our first year of deputation, I have been in a good number of conferences already. I have seen some really good ideas for conferences, and a few times have thought to myself, “man, I wish I had thought of that.” As a missionary I have had opportunities to do some pretty cool things at mission conferences. The churches always want to be a blessing to the missionary and his family, and some churches really put a lot of thought, effort, money, and time into doing just that. My purpose in writing these series of posts is not about giving ideas of what can the church do for the missionary, but rather ideas for pastors and missions directors on having a good conference for your people. Missions conference should be one of the most exciting times of the year for your church. It should be something that your church looks forward to every year. With this being said, I think the best advice I could give to a pastor about his missions conference is this: GET SOMEONE EXCITING TO PREACH!!! If you are going to have a conference speaker who will be speaking every night, make sure he is a clone of Billy Sunday. This is a time when you want your church people pumped up about missions, fulfilling the great commission, and seeing souls saved around the world. The last thing you want to do is schedule Mr. Rogers for such an event. Remember this good word of wisdom, “If there ain’t no fire in the pulpit there won’t be any in the pew.” I can’t tell you how many naps I would have loved to take during a dry, dead delivery of the most exciting thing on the planet. I mean, really, it takes a man of great talent to make the news of Jesus dying on the cross so the world could be saved boring. I know I am not being nice here, but I have been a pastor, and I know the disappointment that I experienced when I had someone to speak about missions and they were a bore. Every pastor wants his congregation to be excited about missions, so get someone who can help you with that. 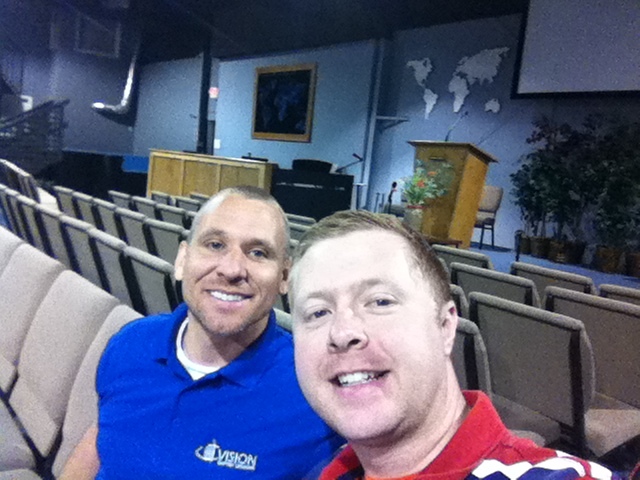 A picture of Jeff Bush and me at Vision Baptist. for me when I was a Pastor and he did a fantastic job. His name is Jeff Bush. Jeff is our director at Vision Baptist Missions, and he is also a veteran missionary. He was very successful in the field, he planted four churches in eight years. I have been there and seen these churches. I have met the men that Jeff trained to be pastors and they are top-notch. Jeff knows what he is talking about. He will be a blessing to you and your congregation, and I highly recommend him. You can find out more about him here. Jeff is an exciting preacher and speaker, and the only thing more exciting than hearing him preach in English is hearing him preach in Spanish. I promise you that Jeff will be an encouragement to your church, and he will light a fire and passion for missions in the hearts of your people.